With fall in full swing, now is the perfect time for High School juniors and seniors to start checking out colleges and universities to determine where their academic career will take them following graduation. At UNOH's Fall Open Houses, there are unique opportunities for students to win up to a full-tuition scholarship! The University of Northwestern Ohio’s Colleges of: Business, Health Professions, and Occupational Professions will hold an Open House on Friday, November 2, from 8:30 a.m. to 3:00 p.m. The University will be offering Full Tuition Scholarships to students who place 1st in tests for Accounting, Business Administration, Information Technology, Medical Technology, and Marketing! Students finishing in 2nd place will receive a $5,000 scholarship, students finishing in 3rd place will receive a $4,000 scholarship, students finishing in 4th place will receive a $3,000 scholarship and students finishing in 5th place will receive a $2,000 scholarship. The test will be administered at 11:30 a.m. in the Presidential Hall of the UNOH Event Center. The scholarship testing is only offered to high school seniors. This Open House event will also feature information about Bachelor Degrees and Associate Degrees in majors such as Accounting, Agribusiness Management, Business Administration, Healthcare Administration, Sport Marketing & Management, Information Technology, Computer Forensics, Marketing, Medical Assisting, Health Information Technology, Legal Assisting, Office Management, and Travel and Hotel Management. An advisor for the programs that are offered in a Flexible Learning Evening format will also be on campus to talk about the unique educational options for adults. The Applied Technologies Open House will feature scholarship testing in High Performance Motorsports, Automotive, Diesel, Agricultural Equipment, HVAC/R, and Robotics & Automation Technology. The winners in each category will receive a $20,000 scholarship with second place winners earning a $5,000 scholarship, third place will receive a $4,000 scholarship, fourth place will receive a $3,000 scholarship, and fifth place will receive a $2,000 scholarship! Testing will be held in the UNOH Event Center at 11:00 a.m. and 1:00 p.m. each day for High School Seniors only. Even though scholarship tests are only available to High School Seniors, the Open House is open to all interested students. 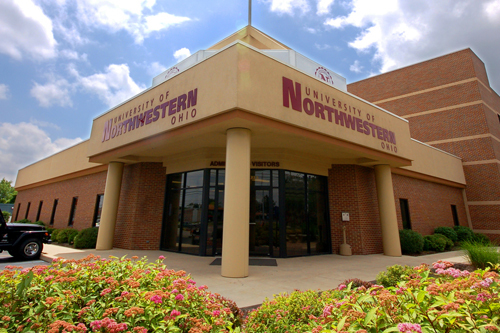 Tours will be given of the 200-acre University of Northwestern Ohio campus. There will be opportunities to discuss financial aid, housing, scheduling, employment, and detailed curricula information with department representatives. Classrooms and training equipment will be on display with opportunities to speak with instructors about courses. UNOH Open Houses are an excellent opportunity for prospective students to become acquainted with the University and the opportunities it offers within each of the five colleges. Open Houses are open to the public.